Still settling a written assignment due tonight… Been writing and rewriting, it’s HORRIBLE. What do you eat when you have piles of homework to do? Baked goods are always a yummy and practical option for me. Hold it with one hand while eating and write with the other- epitome of multi-tasking! Sweet please, I need the sugar to get the brain going. 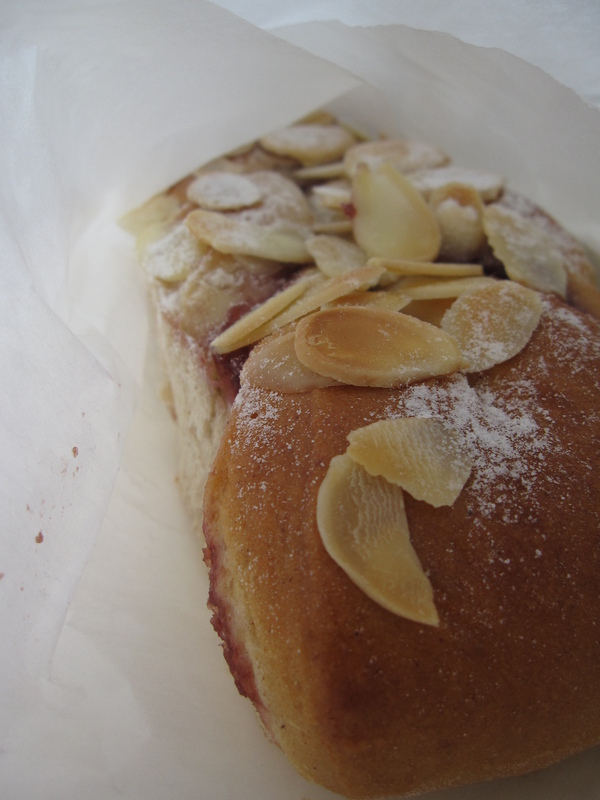 Raspberry swirl from Simplybread was a chewy slice of bread which had been baked slathered with raspberry jam and generously topped with sliced almonds. The sweet tanginess from the raspberry jam was exactly what I was looking for and the sliced almonds added that deliciously fragrant touch. Simple but it’s good enough for me. 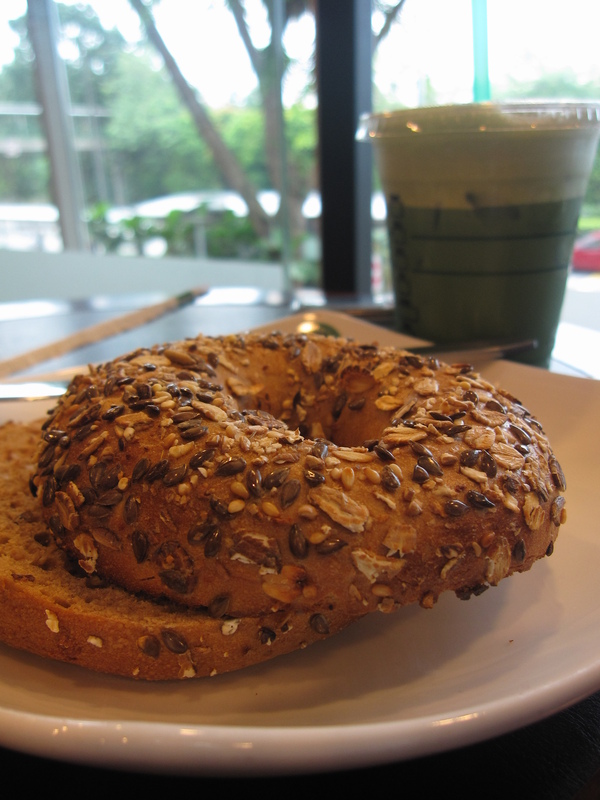 But if I had to choose, I’ll choose the multi-grain bagel at Starbucks over it any day. The chewiness of the bagel was so addictive that I rushed down to grab another. Pair it with a frothy green tea latte or your favourite drink at starbucks for a satisfying meal. Does anyone have any idea if they add syrup in the green tea latte? I find it a little too sweet, might check it out the next round I go. And if you are lucky, you might have a friend who had another friend who bought Krispy Kreme donuts from Australia. Pardon the unappetizing mess but this always happens when everyone is scrambling to try a little bit of everything! Instead of the usual pillowy donuts you get from Donut Factory, these are the dense pound-cake like versions. I always go for the glazed to get that sugar rush but don’t if you are the type who hates sugary stuff. Instead, go for those glazed with bittersweet dark chocolate. 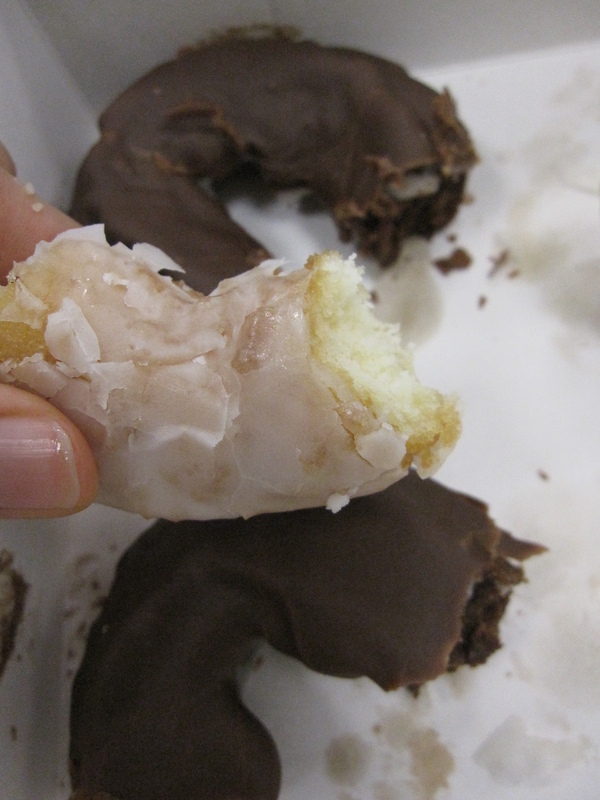 The donuts were scrumptious, how I wish Krispy Kreme would set up an outlet here!